Interpretation and significance. What Did We Learn from Microdialysis? Microdialysis: fact or artefact . Insights into Glutamate Physiology: Contribution of Studies Utilizing In Vivo Microdialysis. The Validity of Intracerebral Microdialysis. Microdialysis in the Brain of Anaesthetized vs Freely Moving Animals. Quantitative Aspects of Brain Microdialysis: Insights from Voltammetric Measurements of Dopamine next to Microdialysis Probes. Methods. New methodological aspects of microdialysis. Principles of Quantitative Microdialysis. Automation of Blood and Microdialysis Sampling: Combinatorial Pharmacology. Dopamine-Acetylcholine Interactions in the Brain Studied by In Vivo Microdialysis. Microdialysis as a Platform for Multidisciplinary Strategies. Ultraslow Microfiltration and Microdialysis for in vivo Sampling: Principle, Techniques and Applications. Analytical chemical aspects of microdialysis Liquid Chromatographic Methods Used for Microdialysis. Microdialysis Coupled with Liquid Chromatography / Mass Spectrometry. Sampling Improvement of the Temporal Resolution of Brain Microdialysis: Sampling in Seconds. In Vivo Peptidomics: Discovery and Monitoring of Neuropeptides Using Microdialysis and Liquid Chromatography with Mass Spectrometry. Microdialysis and the study of behaviour. Microdialysis to Study the Effects of Stress on Serotonin, Corticosterone and Behaviour. Microdialysis of Dopamine and Norepinephrine During Conditioning and Operant Behaviour. Microdialysis in the Study of Behavior Reinforcement and Inhibition. Changes in Acetylcholine Extracellular Levels During Cognitive Processes. CNS Pathology models. Microdialysis in Genetically Altered Animals. The Use of Microdialysis in Neuropsychiatric Disease Models. The Use of Microdialysis for the Study of Neurological Disorders. Online Glucose and Lactate Monitoring During Physiological and Pathological Conditions. Microdialysis in Pain Research. Clinical applications. Microdialysis in Clinical Drug Delivery Studies. Transport of Glucose to a Probe in Adipose Tissue. Microdialysis in the Human Brain: Clinical applications. Microdialysis is currently one of the most important in vivo sampling methods in physiology and pharmacology. It is used to determine the chemical components of the fluid in the extracellular space of tissues. The technique is now well established in neuroscience research and is used excessively in behavioral neuroscience to determine the concentrations and identities of molecules in brain tissues, and their change due to behavior, hormonal and transmitter changes in the nervous system. The book provides a detailed comprehensive overview of the technology and its applications, including application in pathology, drug development, and the application in the clinic. The authors are all well known researchers in Neuroscience and experts in the use of Microdialysis. Organized into two parts of seven sections, the Handbook of Microdialysis critically examines recent developments in the field through a variety of chapters written by an internationally acclaimed group of authors. 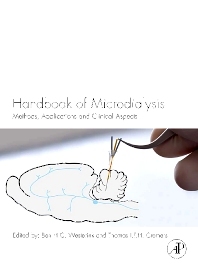 It is the first comprehensive handbook covering the technology of Microdialysis and its applications in Neuroscience. Graduate, post-doc students and researchers in neurobiology, neurochemistry, and neuropharmacology.